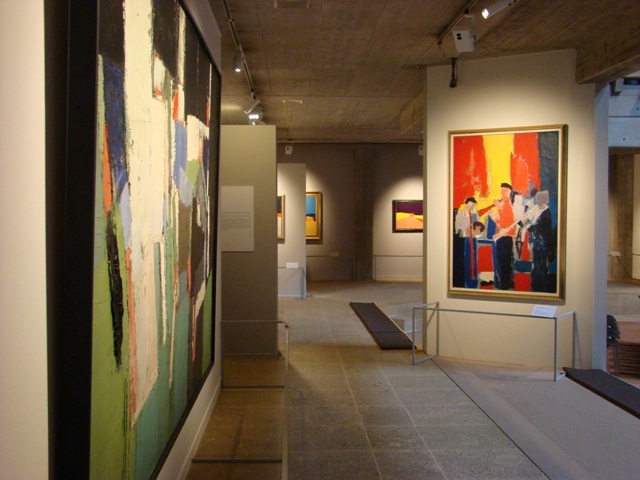 A selection of some of Nicolas de Staël’s finest paintings appears on show at the Gianadda Foundation in Martigny. The exhibition retraces the artist’s steps between abstract and figurative art from 1945 to 1955 just before he took his life at the age of 41. 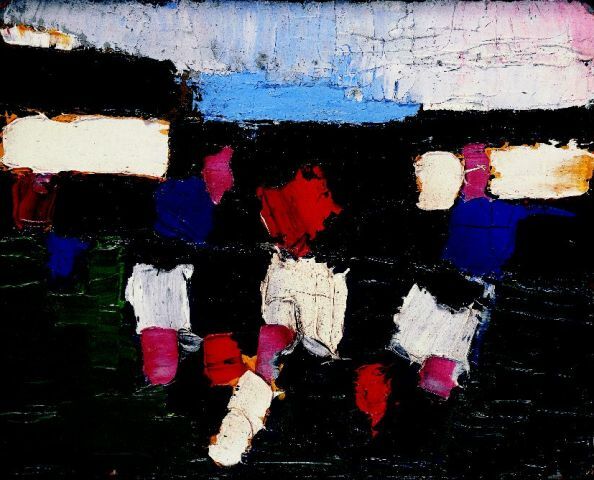 It includes de Stael’s famous football scenes, giving the expo an arresting topicality and adding to its powerful brilliance at a venue not noted for its versatility. 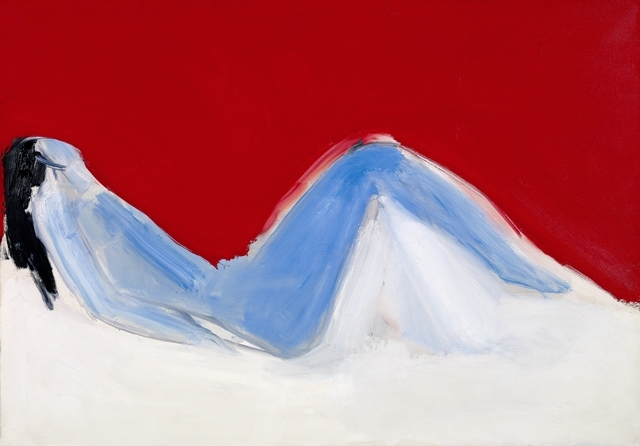 The exhibition in Martigny of the French painter of noble Russian descent, Nicolas de Staël, will come as a complete surprise to those who have written off the Gianadda Foundation as an impossible place to present art in a meaningful way. “I’m struck by how the structure of my father’s painting resists the strength of this building,” Gustave de Staël, the youngest of the four Nicolas de Staël children, who was present at the opening along with two of his siblings, tells Swisster. “Furthermore, the particular lighting gives the paintings a matt aspect, which is something he appreciated in other painters, especially Braque,” he develops. Gustave de Staël (1954), who bears a striking resemblance (see portraits below) to the father who ended his life only months after his son’s had begun, describes the pleasure he always has in rediscovering his father’s painting. “Exhibitions must be site-specific,” says curator, Jean-Louis Prat, former director of the renowned Maeght Foundation at St. Paul de Vence, in the south of France. “A good exhibition must be intrinsically linked to the place for which it is conceived,” he tells Swisster. 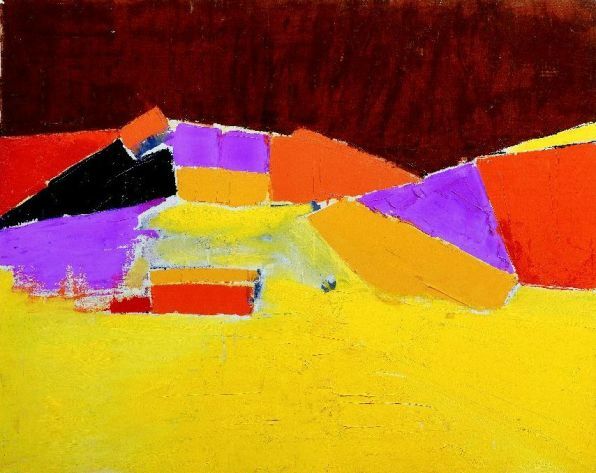 Jean-Louis Prat is renowned for his presentations of George Braque, Joan Miró, Pierre Bonnard, as well as Nicolas de Stael 15 years ago at the Gianadda Foundation. The result is unexpectedly successful, he concedes. 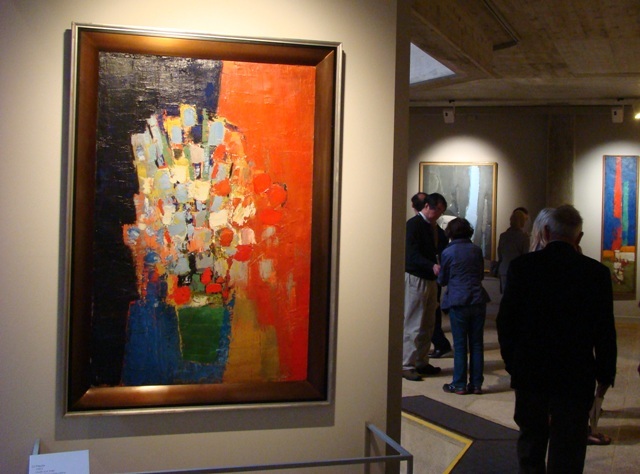 Gianadda’s sunken concrete atrium allows nearly all the large paintings to be visible from a single vantage point. “We are immediately absorbed into a world of amazing intensity,” he reflects. Prat has assembled 80 paintings from prestigious international collections, including the Tate in London, the Phillips Collection in Washington DC and the Centre Pompidou in Paris, as well as fifty drawings and sketches. A man of insatiable curiosity who traveled extensively and entertained close friendships with the writers and musicians of his time, de Staël produced a prodigious number of paintings, 1,000 in all. The artistic itinerary that Prat proposes, illustrates the inner turmoil of an artist caught at the crossroads of the abstract art movement that prevailed just after the Second World War and figurative art to which he boldly returned. The exhibition highlights distinct periods in de Staël’s evolution. 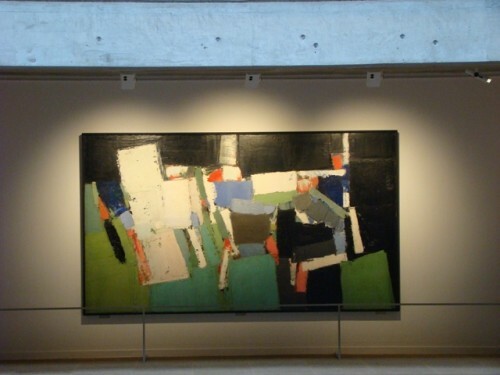 Before 1952, the paintings are busy and lyrical abstract compositions, mostly in earthy colours of beiges, browns and greys. In April 1952 he attends a France/Sweden football match at Parc des Princes in Paris. “Between heaven and earth on the red or blue grass a ton of muscles flings itself around . . . What happiness!” he writes, as he sets out to capture the physical energy of the match (see two paintings above) in several dimensions. “I paint to free myself from all the impressions, sensations and anxieties to which I have never found any other answer than painting,” de Staël explains in March 1953 on the occasion of his first exhibition in New York. 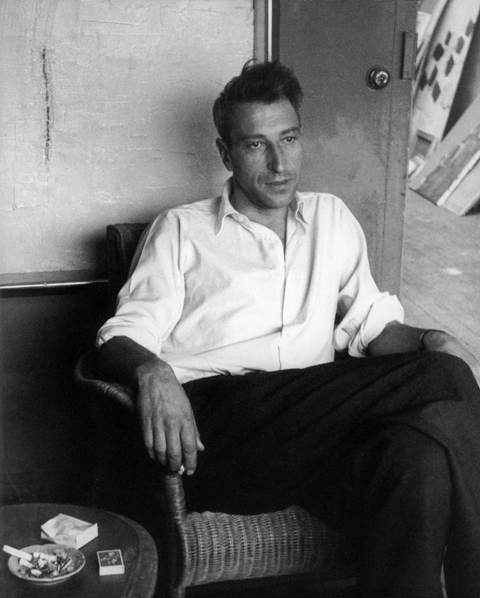 “But my painting is as fragile as love,” he writes to his dealer Jacques Dubourg in December 1954. The year marks yet another turn. De Staël acquires a new fluidity in his painting by experimenting with a technique that rubs out the contours, blending them in with neighbouring colours. But on 16 March 1955 in Antibes, after spreading out a monumental canvas of 4 x 6 meters to paint his impressions of a Schönberg / Webern concert he had attended ten days earlier in Paris, he flings himself from the height of a fortress serving as his studio. “He stayed outside all the currents and schools, always questioning the next steps he would take. 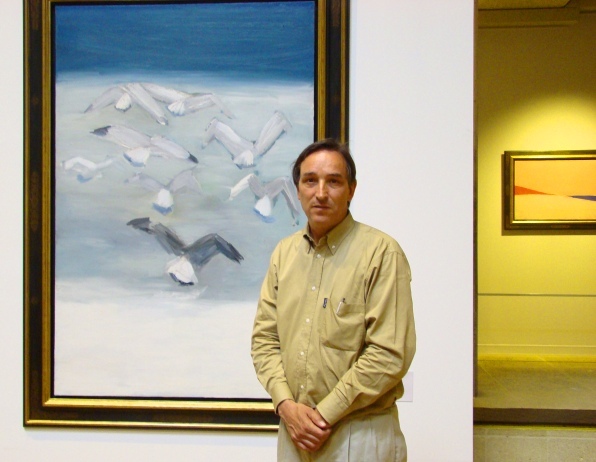 His fierce sense of freedom is what I appreciate the most in him,” Jean-Louis Prat says.